Ha, ha! You gotta love gingham! I am currently making a black and white 1/8 inch playsuit for my 20 yr old! and I have some sky blue 1 inch to make a dress for my 16 yr old both from McCalls 6331, sadly out of print now! Have fun! Lovely gift and surprise! I greatly dislike wearing yellow and orange! Icky. I do like gold and fire colored prints though. My favorite color is RED!! I think it's the best! Have fun working on your new projects! Lucky you! I hope you have a great time sewing with those fab fabrics and I look forward to see the results. I like yellow, but I can't wear it, it makes me look ill, especially mustard yellow. I absolutely love pink, but I can't wear the lightest shades, it has to be medium pink or hot pink or something like that. And I've finally realised that pink is my fave colour! Once I did receive a bolt of pink satin fabric and like you had to be brought around with smelling salts :) So happy for you, that is an amazing gift! Wow - what great friends you have! I'm great with pretty much any collour, but really do not like gingham on myself. I love to see it on vintage garments that are worn by others, and I am looking forward to seeing what you make! My school uniform summer dress was purple gingham, seeing this bolt has brought back lots of memories. Can't think of a more appropriate gift! I'm not a massive fan of purple either but I agree PJ bottoms would be a good way to start. Oh my stars- what a gift! To think you've saved this lovely lovely fabric from the bin! There's nothing wrong with a bit of shine, in my book. I would definitely use that navy gingham for something a bit special. My main colour no-no is orange. I can just about manage a yellow, if it's the right sort of pale lemony yellow, but anything going at all orangey is going to make me look dreadful, however far from my face it is. Ohhh Jane you are one lucky girl!!! I do not know you in person but by reading your blog I can tell you are a very sweet person and I guess a true friend appreciates it. Love your gingham fabric. Too bad we have an ocean apart I will beg you for some purple gingham! Do enjoy it for me please! I am very happy for you! Ooh so lucky! (but you deserve it!) I'm not a fan of purple (though I have a soft spot for lilac) or most shades of green either. I think pj's are a great use for the purple gingham. A bit of lace trim at the hem would be really sweet too. The big navy gingham would look great as a dress, especially a style with a bit of volume in the skirt. Ooh such fun! Can't wait to see what you come up with! You ARE the luckiest girl in the world! I have had a real 'thing' for gingham lately & my Pinterest board proves it. The purple would be my favorite. And it's just me, but I wouldn't want to waste any on pajama pants. Maybe you could make a dress for your sweet friend in her favorite color? Or even a cute vintage style apron. I am bothered when the colors red, pink & orange are all thrown together. Can't wait to see your finished gingham projects! What a great gift. I really like purple but I dont like brown very much. Hope your sewing goes well. I too am a sucker for gingham. I can't think of a color that gingham checks can't make desire able. If you click on my name you will see how much I love it in the banner to my blog! Purple is one of my favourite colours! I had purple hair for ages and loved it! Wow, I am so envious of your fabric windfall - lucky girl! My one colour aversion is hunter green. Yuck! What a lucky girl you are to have such a great friend! It's funny to hear what colors people avoid. For me, it's red. I own some red things, but I always hate how I look in them - don't know why. And despite knowing this, I often gravitate towards red things in the store. Then I have to remind myself of my aversion. I'm much more a fan of jewel tones. I am loving the gingham things I am seeing on the blogs! I remember a pale blue gingham dress with full skirt, puffy sleeves, and a cummerbund I made. Yes, it was the early 60s! Very pink pink I love but it turns be so dull. Has to have some yellow in it, and be a bit darker, like a medium coral, which makes me glow. Have fun deciding what to sew! 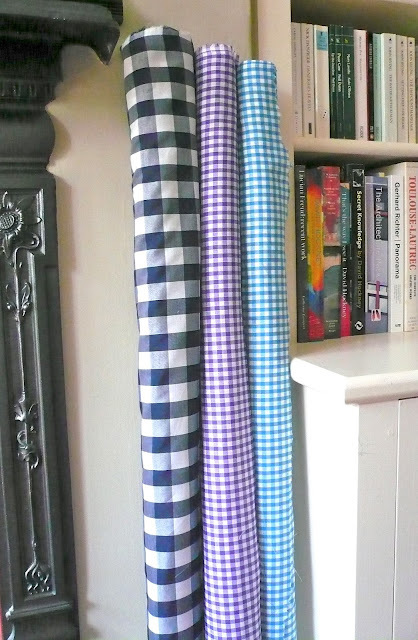 My goodness, the thought of all that lovely gingham in the bin - terrible! I'm sure it couldn't have gone to a better home :) There aren't many colours I don't like but there are certainly colours that don't suit me - yellow being one of them and pastel shades look awful on me. It doesn't stop me buying the fabric if I love it though - I just can't turn it into a garment for me! My daughter has just discovered the 1.5 yard yellow floral fabric in my stash (found in a secondhand shop in Chester, 1970s I think), apparently it 'has her name on it'! I'm glad I was sitting down when I read the bit about these being destined for the bin!! I love the large check navy, and as purple is my favour colour (along with green), I say, embrace the purpleness!! I'm not fond of pink, and whilst I love turquoise, it makes me look like I'm dead. You are a very lucky girl and that was so thoughtful of your friend Siobhan - you should sew something with that purple gingham for her! Ooh you are so lucky! Gingham is awesome! I have an orange gingham I am about to cut into o make an Archer. Lucky you... I know exactly how you feel - I was given a someone else's lifetime collection of fabric which I now call my acquired stash (full and tear jerking story on my blog). I like the turquoise and purple ones. I have an aversion to pink and have had it all my life (I demanded the grey tracksuit not the pink one aged 4!). In fact, pink and floral has me running for the hills. You could make me something with the purple - it's my favorite color. I've been actively adding new purple garments to my wardorbe this year. My color aversion is yellow and anything on that side of the color wheel. It's just unpleasant to my eyes and I'm sure looks terrinle on my. I don't even wear green on St Patrick's Day. Purple pj bottoms AND top! my first though was how I loved the purple. I think it would make a beautiful Hawthorn. I am now listening out for the door just in case someone want to drop of similar bounty ... no, no one there. I think I stay clear of white. Lucky you to have fortune drop three bolts of gingham (in such pretty colors) at your door. I've gotten the occasional bit of fabric dropped off, but it tends to be old curtains, not lovely cloth like you received. My least favorite color is brown. I'm petitioning for it to be dropped off the color wheel. Can't wait to see what you make with the purple. I have some that I used as a skirt for my cutting table. I have some left over that I planned on making the Colette Sorbetto with. Oooh, what FUN! The possibilities are near endless, aren't they?? I'm with you on purple, it's the one color I really don't like. I don't mind light purple like lavender (even have some light purple yarn), and I just bought white fabric with purple flowers on it. Maybe I'm coming around! The first thing I ever made was an Easter dress for my 4 year old niece. It was 1/4 inch purple gingham check. The color I least like is coral because I feel it doesn't flatter most people. It really only looks good on people who are fair skinned which few people are in the California sun. Wow! What bounty indeed. I'm so very happy for you. See...you did a good deed (100 goals...shudder) and were amply repaid! I love the navy...just gorgeous. Looking forward to seeing what you make.